We are on your schedule. You name the dates, and we curate your private and custom holiday experience. Check out what our past guests say: Read More. A Step Above the Typical Self-Guided Tour. Let us curate your dream cycling vacation! Our self-guided cycling holidays blend privacy with independence, letting guests choose how, and with whom, they ride. Customization and flexibility are at the heart our self-guided bike tours. From choosing start and end dates to the level of difficulty and terrain, to how fast you want to ride, self-guided guests choose their own adventure. Once trips are underway, total freedom on any given day is granted. Rise early? Stay in bed? Spend more or less time here or there? Guests are free to choose. And to ensure your cycling vacation is perfect, a local concierge/guide will always be available and nearby to support you. Allow us to curate a custom private self-guided bike tour! Our private, custom bike tours provide highly personalized experiences. Low-hassle customizable tours that are created to fit each guest’s interests, and needs! You name the dates and we curate your private tour. Ride in confidence with the support of a local dedicated concierge/guide. Included in your tour are all luggage transfers, jerseys, GPS guidance, and much more. High-quality rental bikes available – road, hybrid and eBike. Want more info? Click here to learn more. We explore the best of the France, Italy and the USA. 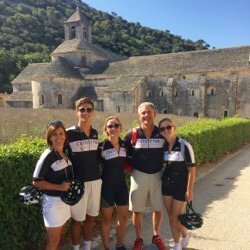 We create experiences from the rolling hills of Provence, the Dordogne, and Tuscany to the heights of the French Alps & Pyrenees and the Blue Ridge in Western North Carolina. On one of our self-guided bike tours, you will experience the best balance of personal service and exploration. A vacation on your terms! Start your search below and allow us to curate your cycling vacation! If this is a "self-guided" tour, why do I have a guide/concierge? Our local contact is dedicated to ensuring that your holiday goes as smoothly as possible. Think of them as your local friend showing off their home while you’re in town for a visit. They are there from greeting you at the beginning to saying goodbye at the end. OBT concierges take care of curating excursions taking care of mechanical issues & roadside assistance, luggage transfers from hotel to hotel, providing assistance with routing, and much more. They are a phone call away, and there for you. We deliver this level of service because you’re exploring an area unknown to you, and having a local contact provides great peace of mind. Let us streamline your holiday so that you can focus on having fun! OBT’s level of service is well above the typical self-guided experience. We take care of everything except pedaling the bike….except for eBikes. The eBikes we provide will help you pedal! All hotel accommodations – mostly 3 and 4 stars but ask for custom accommodation requests. The use of a Garmin Touring GPS unit during the tour for worry-free routing. This feature is included in your fee for tours in Provence, Tuscany, and Asheville. For other destinations GPS unit rentals are available. The unit comes with your daily routes pre-loaded. For destination without this feature: 1) you will receive the GPS courses to upload to your GPS device, or 2) We can rent you a GPS unit. Meals as explained in the tour itinerary pages. Usually, this means all breakfasts, no lunches, and some dinners. Why is a Private tour better? Our tours are centered around accommodating our guests and the experience they are craving. Not the other way around. Have you ever been stuck with a group of people you don’t know and may not particularly like? Or have been required to go along with tour plans or excursions that you were not excited about? Have you ever been in a tour group where you feel like you’re being herded along and hurried regardless of what you’d like to do? We’ve been there and don’t like it either. A private tour allows you to travel when you want and with whom you want. Bring your friends, family, partner, or simply yourself. Let us curate an experience for YOU! We're on your schedule? How? From when you register for the tour through the duration of your tour, we cater to your timing. YOU get to name the dates of your tour. You don’t have to choose from a calendar of tours that require you to adjust the timing your vacation plans. Want to start on a Wednesday? Sure! Want to be on tour for 5 days rather than the 6 days on our sample itinerary? That is OK with us. When on your tour you are not being pushed to get on the bike at a certain time with a group. You rise, have breakfast, and roll out when you’re ready. Want to spend more time exploring an area on a daily riding route? Sure! Just make sure you get to the hotel in time for dinner. Are bike rentals available? If so, what kind? High-quality rental bikes available – road, hybrid and eBike. We will deliver the bikes to you and fit them to you at the beginning of the tour. Your guide/concierge is always available for help if you have a mechanical issue. How customizable are your tours? We are very flexible in the destinations we offer tours. Customization options include the number of days/nights on tour, accommodation level (but we DO NOT go under 3-star), new towns/villages within established destinations, and much more. We are open to trying new things in new destinations! Please ask if you’re not seeing what you want! We have a minimum of 3 or 4 nights on tour, depending on destination. How are you "a step above the typical self-guided tour"? The level of service we deliver is beyond the average self-guided tour. You have the freedom of choosing your tour dates and the flexibility to customize your tour itinerary. During your tour, your local guide/concierge is there to help you every step of the way. We require them to have more regular contact with you, our guests, than what you’ll experience with other tour operators. In fact, some of our guides have been known to offer to ride with you on certain tour dates, if you wish. If you’re looking to experience a polished professional tour, we are your only choice. 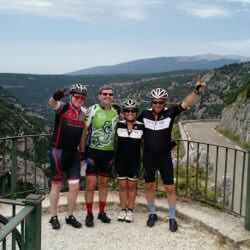 Included in your tour fee in Asheville, Tuscany & Provence is the use of one of our Garmin Edge Touring GPS units for the duration of your tour. These easy to use GPS units provide an excellent worry-free routing method that you can depend on throughout your tour. When you arrive the daily routes will be preloaded, and ready for you to use each day of your tour. All you have to do is start the daily route at the beginning of your riding day, and follow the highlighted line! At the beginning of your tour, your local guide will show you how to use the unit. Additionally, we provide instructions that you can reference when needed. As a backup and supplement to the GPS, we provide a local map as well as routing instructions. For all other destinations, we GPS provide rental options. How short can a tour be? Do you provide one-day guiding? We have a minimum of 3 or 4 nights on tour, depending on destination. We do not provide one-day guiding. Can I have a guided rather than a self-guided tour? Yes, for most of our destinations and most of our itineraries we can create a fully guided experience. Note that a guided tour requires extra planning lead-time and additional cost. Where can I learn more about OBT's Self-Guided tours? Click on our SELF-GUIDED TOURS page. 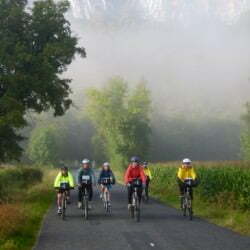 Guided and self-guided scenic bicycle tours. 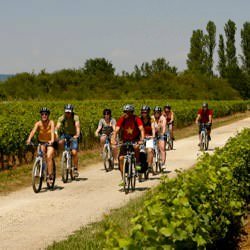 Self-Guided Bike Tours in France, Italy & the USA. 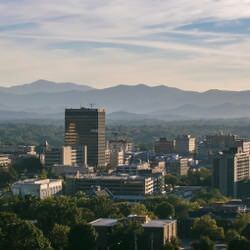 Destinations include Provence, Tuscany, Burgundy, Provence, the Alps & Asheville.